Have a bunch of video tapes you need to save to your Mac? Vidbox makes it easy. The straightforward Video Conversion for Mac software walks users through every step of the process. Weighing less than two ounces, the box connects to (and is powered by) a free USB 2.0 or 3.0 port on your Mac with the included cable; the manufacturer recommends a direct connection, but I used it with no problems attached to a hub. The device is made of plastic and the build quality feels a little on the cheap side, but the quality of the captured video and audio was representative of the original source material, with no visible degradation from the encoded MPEG-4 files with AAC 128Kbps 48KHz audio. Vidbox is an input-only device, designed expressly for one-way conversion of analog tape signals to the digital format. It can’t output to a television, nor be used as a second Mac display. 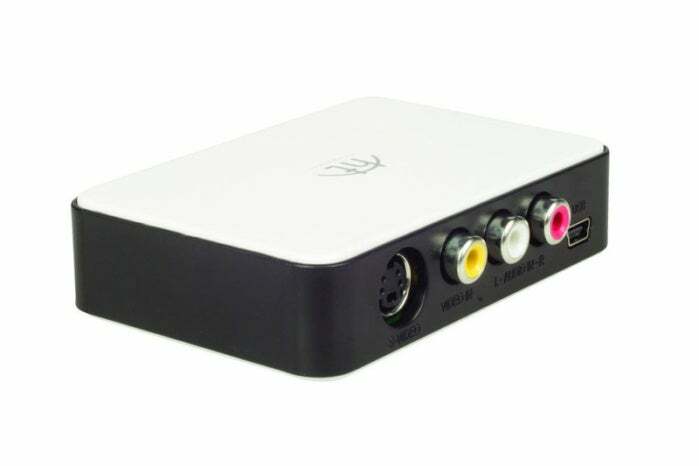 In addition to VCRs and camcorders, Vidbox can be used to record from DVD players, cable boxes, and game consoles, as long as the content doesn’t have copy protection enabled. Use the slider to determine the length of a recording, and Video Conversion for Mac will automatically stop at the desired time. 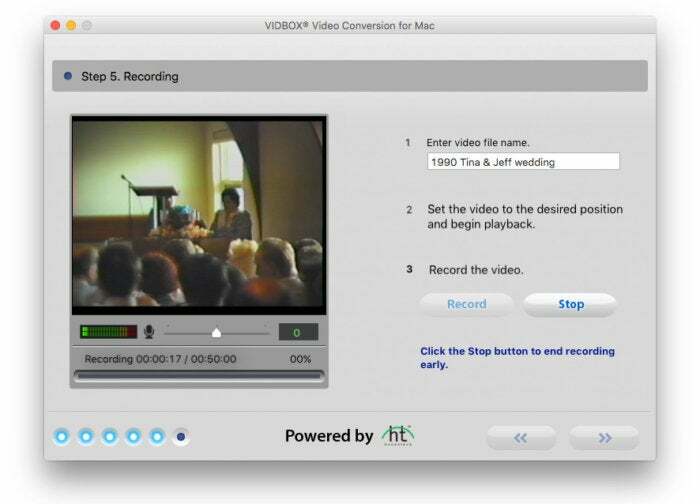 Vidbox Video Conversion for Mac is a very straightforward, no-frills affair. When the application is launched, you’re asked to choose the type of video device from six available choices. The software then walks you through a couple of setup screens to choose a connection type and get everything plugged in. Recording takes place in real-time, so you can sit back and enjoy treasured memories as they’re archived in digital. Now it’s time to enter a file name, begin manual playback, and click Record. Capturing is done in real-time, so a two-hour tape takes the same amount of time to convert. During this time, you can watch playback on your Mac display (double-click the monitor window to go full-screen), or adjust the incoming volume level if needed. The resulting 640 x 480 QuickTime files can be opened, synced to iOS devices via iTunes, imported to iMovie for editing, or saved to other applications by dragging and dropping from the preview window. There are no settings for capturing frame rates other than 29.97 (NTSC, SECAM, and PAL video standards are supported, however) or adjusting the encode quality, but all files are saved as progressive, so you won’t have to deal with the interlacing issues inherent with analog formats. When a recording is finished, Vidbox offers a few one-click ways to do more than just watch your videos. 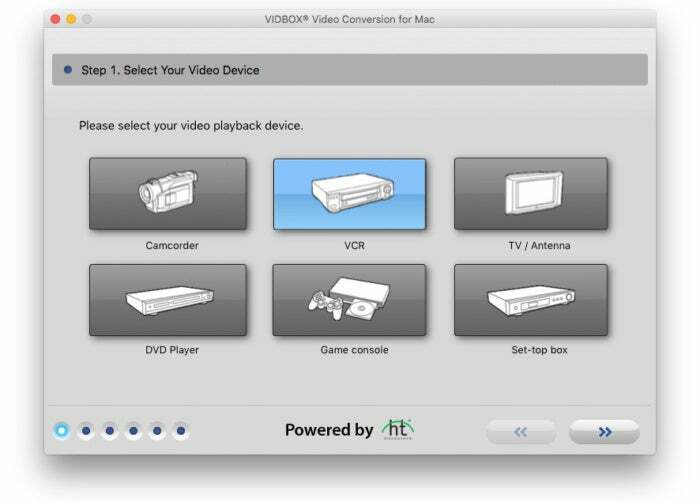 Vidbox Video Conversion for Mac is an affordable way to archive analog videotapes, assuming you still have an old camcorder or VCR around to play them from.